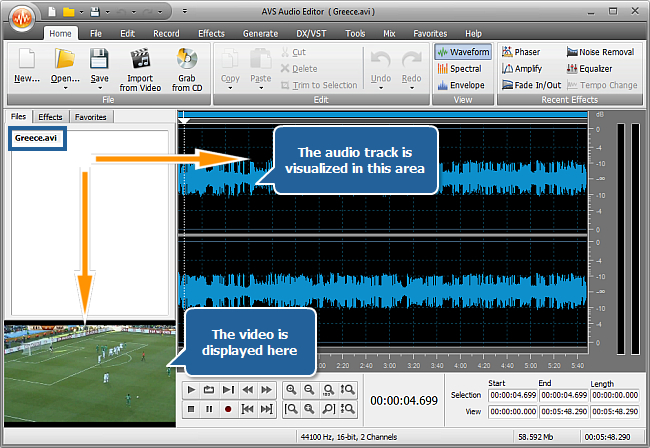 How to mute vuvuzela horns with AVS Audio Editor? During the Football World Cup™ it may happen that the loud sound of vuvuzelas (plastic horns) drowns all the other sounds in your own video recording of a football match. 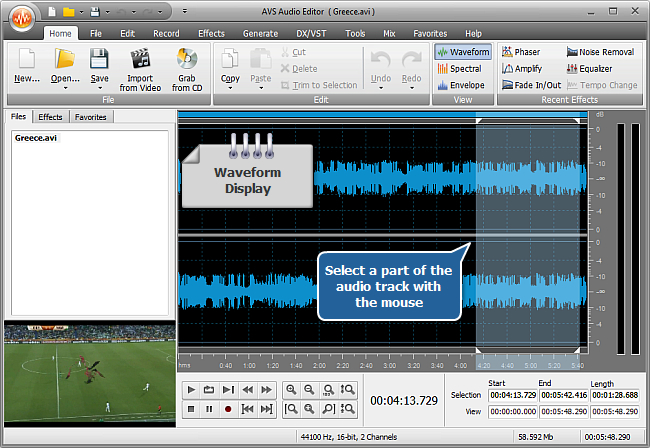 AVS Audio Editor offers you a preset that lets considerably reduce annoying blowing of vuvuzelas and preserve other sounds such as referee's whistles, football fans' yells, sports commentator's voice etc. (if they are present in an original audio track). 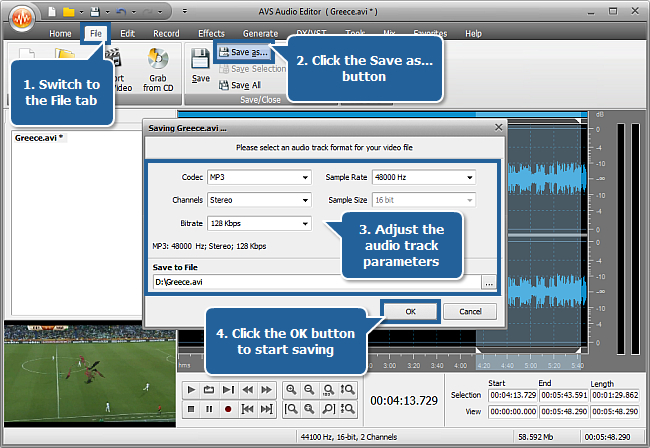 Follow the steps below to enhance the audio track of your video recording quickly and easily. Click here to download it. 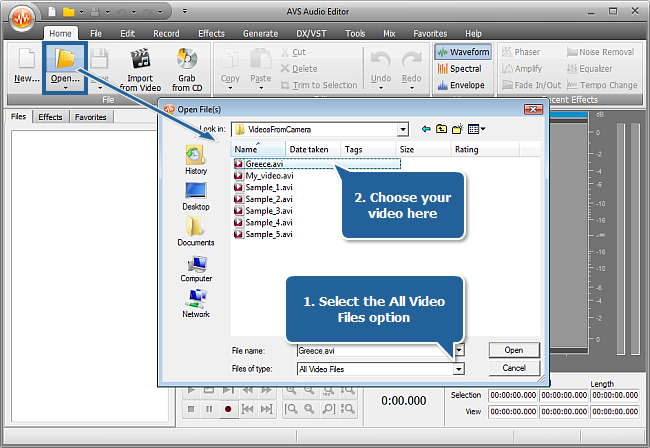 After the download is finished, run the AVSAudioEditor.exe file and follow the installation wizard instructions. Press the Open button on the Home tab of the Ribbon Command Bar. In the opened Windows Explorer window select the All Video Files option of the Files of type field and browse for the necessary video file saved on your HDD. Press the Open button of the Open File(s) window. Your video file will be visualized at the bottom of the Files section. The audio track will be displayed in the Waveform Display. You can process the whole audio track or select only a part of it. To choose the needed fragment click within the Waveform Display and without releasing the left mouse button move it until the position where the required fragment ends. Go to the Effects tab and press the Batch button on the Ribbon Command Bar. The Batch Processing window will appear. 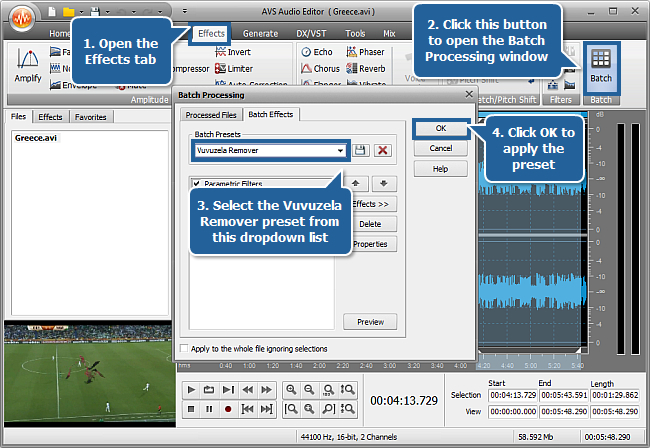 Select the Vuvuzela Remover preset from the Batch Presets dropdown list. Switch to the Processed Files tab of this window and make sure that your file is checked in the list. Note: pay attention to the Apply to the whole file ignoring selections option. If you have selected an area for applying the preset at the previous step, then uncheck this option. Press the OK button to apply the preset. Note: you may also mute vuvuzela horns with the help of the Noise Removal effect. For more information about Noise Removal, please refer to the Noise Removal page of AVS Online Help. Switch to the File tab and press the Save as... button. The Saving window will be opened. Here you can change the audio format parameters: Codec, Channels number, Bitrate, Sample Rate and Sample Size using the corresponding controls. Set an output file name and select the location for your resulting file using the Save to File field. Press the OK button to start saving. As soon as the process is over the confirmation window will appear. Now playback your saved video – you will plainly hear all the commentaries without any blowing of vuvuzelas.